In post 9/11 America the construction of new mosques in the US has sometimes sparked controversy and even confrontation. Is that why some new Muslim houses of worship are being built without the most recognisable features of Islamic architecture - minarets and domes? The National Islamic Center in Washington DC is an imposing building with a towering minaret. One of America's iconic mosques, it is surrounded by the flags of the Islamic countries which helped pay for its construction in the 1950s. Its design was influenced by classical and traditional architecture in Egypt. Akbar Ahmed, a professor of Islamic Studies at American University in Washington DC and one of the world's leading experts on contemporary Islam, says it would be impossible to build such a national mosque today because of the controversy it would arouse. "It's a bad time for Islamic architecture," says Mr Ahmed, former Pakistani ambassador to the UK. "If there was some visionary with money who wanted to build the Taj Mahal in the US, he'd be attacked as a stealth Jihadist." For centuries, domes and minarets have been an integral part of the architecture of mosques around the world. 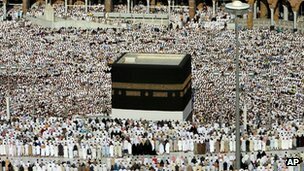 But now, Muslim communities are exploring new concepts in the design of their places of worship. "I don't think identity should be based on symbols only," says Haris Tarin, director of the Washington DC office of the Muslim Public Affairs Council. "Identity has to be based on the fact that you are part of a community, part of something bigger than you." Communities need mosques that can provide services to an aging population and offer a welcoming environment to a younger generation of Muslim Americans, particularly women, he says. Mr Tarin is the co-founder of Ehsan Center in San Fernando Valley, California, a mosque that opened a year ago and serves as a vibrant community centre with programmes for women and young adults. It has a plain exterior and no minarets. "You can have a grand dome and grand minaret, but if it doesn't really serve the purpose, if it only has a large prayer space and nothing else, then you're not really fulfilling the needs of the community," he says. "That's why, to be very honest, a lot of young professionals and a lot of young people don't feel comfortable going to mosques." Architect Maryam Eskandari, former associate director of the American Institute of Architects, is touring the US with a photo exhibition illustrating the transition of American mosques from traditional to postmodern design. She says Islamic architecture has long been subject to personal interpretation and set in a cultural and historical context. "The Kaaba itself doesn't have a dome, it doesn't have a minaret - that was built later on," she says, speaking of the Mecca building that is Islam's most holy site. "It's just a cube. So traditionally speaking that is the idea of Islamic architecture." 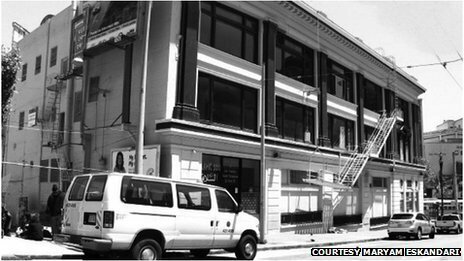 Ms Eskandari points to Park51, a Muslim community centre in lower Manhattan that provoked outrage because of its proximity to the site of the terror attacks of 11 September, as the epitome of a new Muslim-American identity. 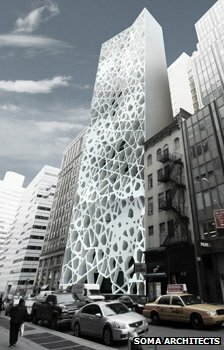 Park51's planners rejected domes and minarets, she says, because Muslims in Manhattan wanted a skyscraper mosque. "That's how they are relating to the infinite concept of God, through geometric shapes," she says, "which is perfectly fine." Ms Eskandari says good design drawing on the original principles of Islam can improve gender equality by making sacred spaces accessible to women. "When the Prophet Muhammad created his first mosque in Medina, his house was attached to the mosque," she says. "Women were invited to come and pray in that mosque - men and women together. "When they renovated the Medina mosque they created one space, but women just tended to be shifted out. The same thing happened in Byzantine architecture. In churches they didn't necessarily include women and if they did, women were up in the balcony area. That vocabulary filtered into Islamic architecture." Mr Ahmed, the former ambassador, says he sympathises with attempts to modernise Islamic architecture and to create mosques that are more in keeping with American culture. "For non-Muslims [the mosque] has become the symbol of Islam and therefore a target," he says. "Therefore, the building of a mosque is not just the innocent putting together of brick and mortar. It signifies a debate taking place in the US about Muslim identity and about American identity." The Muslim community is feeling very much under siege, he says. 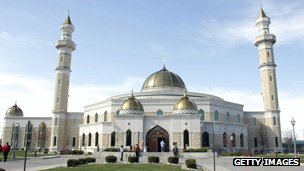 "I understand why Muslims would be very reluctant or hesitant to make a mosque that looks like a traditional mosque, which they could have done comfortably in the USA a few decades ago," he says. "That, in a sense reflects where America is today." The dome and minaret are the most easily recognisable visual markers of a mosque, says Nasser Rabbat, director of the Aga Khan Program for Islamic Architecture at the Massachusetts Institute of Technology. But Islam does not require those architectural features, he says. "The call to prayer could be made on electronic devices and the dome is completely unnecessary. Even Islamic countries have been experimenting with modern design. "But I would resist encouraging Muslim communities to dispense with them from fear, but to do it because it's good design to come up with modern forms. I would advance the notion of designing new and modern mosques without these two elements, but not to conceal their identity."